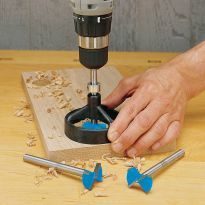 Right-angle drill head fits into tight spaces—ideal for installing hardware in narrow cabinets. You don't need an expensive dedicated right angle drill to drive screws in hard-to-reach areas—just attach this Right Angle Drill Attachment and pop in the 1/4" hex bit of your choice. The low profile head provides easy access to narrow cabinets so you can install hinges and drawer slides without having to reach for that stubby screwdriver. I was installing some shelves and this little drill attachment was awesome. Was able to get into tight and awkward spots to make the job go quick and easy. Really like the handy handle, which makes for easy use. Highly recommend this item. The best part was that I was able to find it. Didn't have to order and wait for it to come in. Thank You Rockler. I finally got around to using this tool that I ordered some time ago. I needed to drill a fee "weep" holes under the bottom of my stucco to allow moisture to get out. This was the ticket that allowed me to accomplish this task. I did have a problem finding an appropriate drill head but finally found one. When I looked at the photo in the online catalog, I had no idea how SMALL the unit was! 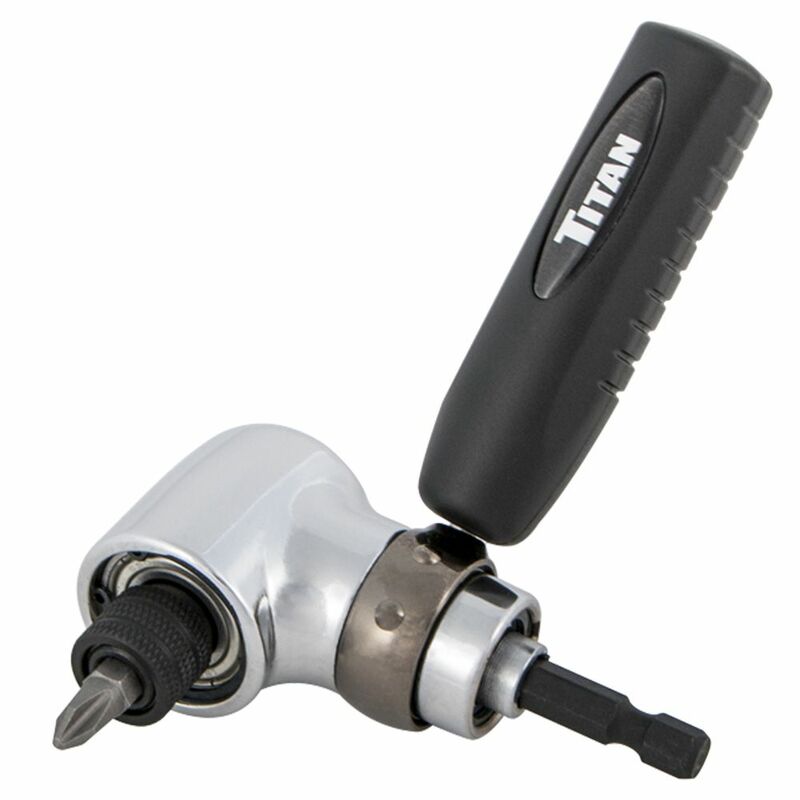 It is a little more than 2" front to back, a seriously compact tool. The detachable handle was not necessary for my function but could come in handy in other functions. I had to drive some small hinge screws into a solid oak faceframe. It took almost a half hour of screwing around in a 5" space with various screwdrivers to NOT get one screw in. I got the hinge plates with 2 screws each placed in less than 2 minutes with the angle driver. Gold plating it couldn't make it better! Just what I was looking for. Works perfect in tight places. I would recommend it. I love how compact this is. Works really well and I like the little removable handle. I have more than one right angle drill and right angle attachment. This one is the smallest. I was able to use the 1/4 inch drive socket to drive a 1/4 inch hex head screw in a very tight place. Nothing else would have worked. Very happy with this purchase. Works great. Needed to drill through rafters to run new wire, but only had a six inch hole in which to work. Handled a 3/4 spade bit with ease. Had a very limited area to work in and this worked great. When I got this, I thought it might be a little light to do the job, but I was wrong. Worked great. Yes I would recommend this tool. This tool is great. I used it to drive 256 pocket hole screws on the inside legs of 4 bar stools. The closeness of the legs (9") made it impossible to drive with a standard drill. 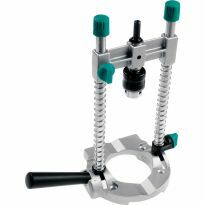 This tool made it easy to do as the drill is in a vertical position when driving the screws. Good quality. Accepts standard hexhead bits. Head diameter is 5/8”. 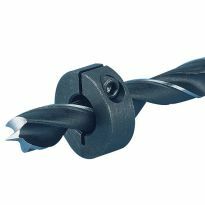 Can be used to drill with hexhead drill bits. Gears feel like there's some bad teeth on them. Ran on a drill for a minute housing heated up gear drag increased. I'll be sending this unit back. Inside furniture and cabinet work. Need to install new balusters and railing. On one side have only 6 inches of clearance. Always wanted one of these to help in tight places. Price makes this a very good deal. Building built-in bookcase with hard to reach screw locations. A former similar device was taken. To keep from buying a dedicated right angle drill no more than I need it. Christmas gift for my husband. He requested it. Need it to apply timberlocks underneath bottom rail of deck. I had very narrow, 5",drawers to install slides and think this is very good to use with an elec. drill. I sometimes have to work in close spaces. For the convenience and versatility. Will be great for tight spaces. I've struggled with drilling in tight spaces for years; this was recommended by a friend. Always have a need to fit into tight places so I am hoping that this Right Angle Drill Attachment will allow me that flexibility. This will just come in handy. No need for it right now, but I could have used it in the past and will need it in the future. Sale price triggered the buy now. I thought it might come in handy while I was in a buying mood. So far, not so much. I still have hope, though. Need to get into places that are close without taking things apart. can the handle be taken off? BEST ANSWER: Yes it can be taken off. This is one great tool for working in tight places. I used it to drive 64 pocket hole screws in a 9" clearance when the Kreg bit and regular drill was too big. Yes it can. The handle screws into the ring that you see in the picture and seats agents the body when you tighten it. This allow for the handle to be at any position. Yes, the handle can be removed. It also can swivel 360 degrees around the head of the attachment if you partially unscrew it. It is shipped with the handle off. I have not used it yet but it must be able to be removed to be shipped. Yes, handle just unscrews from attachment. Yes. It comes with the handle removed. yes. It screws on and off as desired. Yes, it screws on and off. Can you also use this for drilling holes? BEST ANSWER: Yes, but you'll need either a drill chuck with a 1/4" hex drive or bits with the same drive. 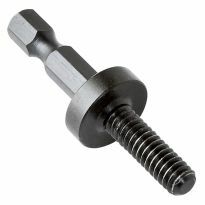 Also available are "stubby" hex drive bits. Can be very handy in tight places. Yes you can. It works very well, you just need to put the pressure on the end of the attachment, not the drill. Note that it only accepts drills with hex ends. Yes, as long as you have the drill bits with the Apex type shank. Have drilled many holes in tight spaces with it. You can, but I wouldn't recommend it. I burned out the bearings on mine doing that after a few holes! If you use a drill bit with a hexagonal end, you can. It's a handy little tool. Only if you have a set of drills that fit in the hex drive. There is no chuck. Yes you can but I would not try to force the drill. BEST ANSWER: the gears are not exposed, so you really can't tell.It's a pretty heavy little tool, for it's size, so Iwouldn't be surprised if they were. I think the bevel gears would have to be steel to stand up to the internal stresses. I have never tried to take the unit apart to see for myself. it replaced a similar unit I had for decades. This one is smaller and lighter and appears to do the job well. You can' see the gears but it is well made. I would have to guess that they are metal. For $15 it will do all you want it to do! Everything appears to be metal. Works pretty good in tight situations. I need actual drill heads to make holes for this tool. Where can I buy them? 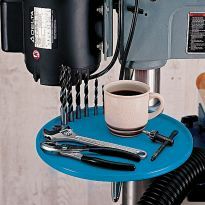 BEST ANSWER: Rockler sells them, as well as most good hardware stores. Can anyone tell me the width of the head without any bit?